Ideal as as a primary, additional or back-up source of power, this 11 kVA genset from the Panther range is both compact and able to offer output of up to 43,4 amps (single phase) or 14.5 (treephases) making it ideal for providing power for homes, offices, farms, small building sites, concert equipment, milking robot, fairground rides, cold rooms… and can also be combined with a lighting tower to provide light for night construction work and power for a wide variety of tools. This 10 kVA (continuous power) industrial genset is available in single-phase and three-phase versions and is fitted with electronic control and soundproof enclosure. It is fitted as standard with a Deep Sea Digital Controller benefiting from an automatic start-up system and integrated automatic transfer switch. 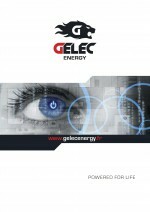 Cogeneration system option: simultaneous production of thermal and electrical energy. Bi-Oil option: uses vegetable or recycled oil as fuel. 1-year warranty* or 1,000 hours, whichever comes first.